Whether we like it or not, rapid growth in the CBD industry has brought with it plenty of low-quality CBD products that have been made by companies who are merely trying to make a quick buck. The fact is, word about CBD is spreading at an incredible rate all across the world. While there are multiple high-quality brands out there who are truly trying to make a difference and better the lives of others, there are just as many dubious firms creating “half-baked” products in an effort to turn a bit of profit. Our goal here at Shopping CBD is always to present to honest reviews on the top brands out there, so that you can then decide for yourself what might work best for you. 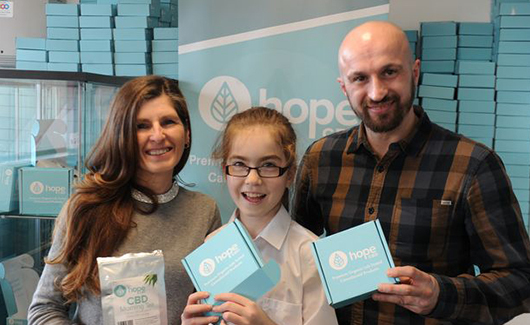 Today we will be taking a closer look at Hope CBD, a company that was recently in the news thanks to their medicinal cannabis oil which helped an 11-year old school girl to overcome a condition known as Episodic Ataxia Type 2. Ayvia Parkinson started taking CBD oil in tea to treat her condition (which causes vertigo, dyspraxia, migraines, and global development delays), and her parents say that the tincture changed her life. Hope CBD is based in Hamilton, Scotland, which is just outside Glasgow. They are proud CBD providers in both the UK and Europe market, and are a small company that started like many others – out of suffering. Having a family member who suffered from fibromyalgia, they eventually discovered CBD after endless hours of searching for something that could provide some much-needed relief. Someone asked if they had ever tried CBD, and this set in motion a story that would eventually end in the creation of Hope CBD oil. Searching for quality products was a challenge and left them frustrated — especially in the UK where the CBD market was by no means “mainstream.” This was reflected in the quality of products that they received, which more often than not came with handwritten labels (which did nothing to instill confidence in the family). This is why Hope CBD was established — to provide high-quality cannabinoid products that people deserve. After their experience with the UK CBD market, the initial thought was that people deserve better and this is at the forefront of everything Hope CBD does. The company motto is that consumers deserve a better product, better customer service, and better user experience, and it is indeed evident that the folks running the operation are willing to put their money where their mouth is. We absolutely love how committed Hope CBD oil is to providing the best possible products to their consumers — it’s not every day that you come across brands who have this intention. What’s more, you really get the feeling that Hope CBD oil is true to their word, and not just a sales pitch. This is a company that really wants to help people and improve the quality of life of many through their CBD products. Customer service: Hope CBD is very much customer focused and makes it as easy as possible for customers to contact them. There is an email address (info@hopecbd.com), contact number (08000 886 509) and a live chat option on the website. You could also visit the shop directly in Hamilton. Free shipping: Hope CBD offers free ‘No Rush 2-4 Day’ shipping as standard on all UK orders. Most companies require a minimum spend before offering free shipping, so this is a big plus. If you require next day delivery, it costs £4.50. All orders over £100 qualify for free next day delivery. 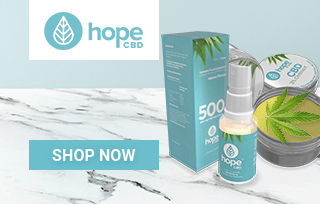 CBD information: The Hope CBD website has a section that is dedicated to CBD FAQs. They answer all the basics about CBD; it’s legalities and dosing. It’s great to have all this information compiled for quick access and viewing. Quality control: All of the Hope CBD products are certified as organic by Servicio Certificación CAAE. More importantly, all extracts are claimed to be independently lab tested for their cannabinoid content, as well as a lack of herbicides, pesticides, harmful chemicals, and artificial fertilizers. Full-spectrum extraction: The CBD oil is extracted using full-spectrum extraction which means that their products include all natural aromatic terpenoids, as well as a range of cannabinoids, including; CBD, CBG, CBN, and traces of THC. Hope CBD certainly goes out of their way to emphasize how important quality products are, which is why we find it rather odd that there is no evidence online of their lab results. Many brands include a link on their website to check these results, merely as a means to show consumers exactly what is in the products and to guarantee quality. However, there is a “lab results” tab on the website – but there is no content available. Hope CBD does also confirm on their homepage that products are lab tested. So, we can only hope that they will add this very important information in the near future. Hope CBD has a rather impressive selection of CBD products. Most relevant and unique is their collection of teas – which is, of course, a staple of the British diet. Here’s an overview of the products that are sold here. CBD e-liquids: There are three different flavors of e-liquids available: Menthol, Blueberry, and Strawberry. Each of these is sold in quantities of either 250 mg or 500 mg. Since the e-liquids are made for vape pens, they also sell an Innokin Endura T18E CBD vape pen. CBD oils: There is a natural cannabis oil which contains 2.5% of CBD, a 300 mg CBD oil (20 ml), and a 2000 mg CBD oil (20% CBD). There is also a 500 mg CBD spray, as well as an Advantage Plus Peppermint flavored CBD oil which is available in strengths of 200 mg and 400 mg.
Confectionary: The Hope CBD hard candies are packed with 5 mg of CBD in each. They have been made using three ingredients; Honey, Propolis & Oil that has been extracted from hemp that is naturally rich in CBD. These candies are available in packs of 10 and 30. 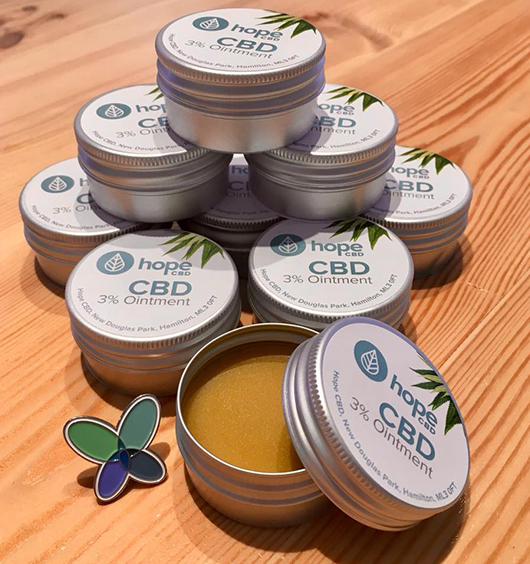 Skincare: Hope CBD has a CBD ointment that is a great topical for the skin. It’s a multi-purpose, CBD-rich skincare balm, that is great for everyday skincare. It has been extracted from hand-harvested cannabis flowers. It contains 3% CBD and comes in a 30 ml jar. Teas: There are three blends of tea available; Morning tea, Evening tea, and a Black Turmeric tea. All of the tea has been made with certified organic hemp that is EU-approved. These tea bags are a great way to unwind after a stressful day or, make you feel refreshed and energized for the day ahead, depending on which tea you drink. CBD e-liquids: The 250 mg e-liquid costs £24.99, and the 500 mg option is sold for £34.99. The vape pen sells for £27.99. CBD oils: You can buy the natural cannabis oil for £19.99, the 300 mg bottle for £29.99, or the 2000 mg bottle for £119.99. The spray sells for £36.50. The 200 mg Advantage plus oil costs £27.95, while the 400 mg option is sold for £34.95. Confectionary: A 10-pack of candy will cost you £9.99, while a 30-pack sells for £24.99. So you could save a few bucks if you buy the 30-pack. CBD Teas: All of the teas are sold for £9.99. 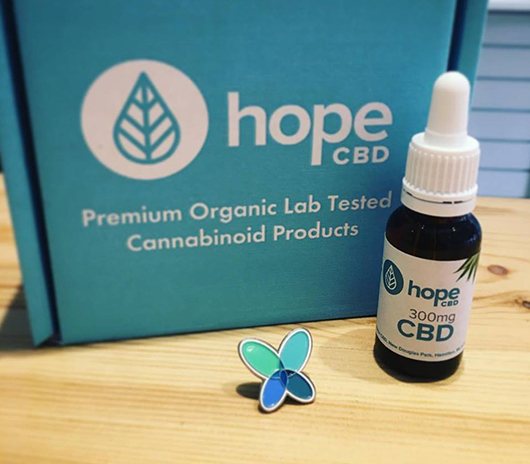 While Hope CBD might still be a relatively small company, they have quickly developed a very dedicated customer base — at least in the burgeoning UK market. The majority of reviews that have been done thus far are positive, and customer feedback is very complimentary, to say the least. Lastly, it was pretty clear throughout the duration of our Hope CBD oil review that the products were effective and offered great value for money. In other words, if you’re a UK or European-based customer looking for a safe, reliable tincture, they’re definitely worth giving a try. I've begun to use the Transdermal Patches, not only because they are so subtle but they really help me de-stress throughout the day. Dean from Ashburn just bough! Gerardo from Ashburn just bough! Kaiden from Ashburn just bough!